Paul Mathias, a truck driver who stepped in to help a family when their SUV was struck by another vehicle, today accepted the Goodyear Highway Hero Award. Mathias, a U.S. military veteran, had just stopped his truck at a red light in Phoenix, Arizona, when a vehicle slammed into an SUV inhabited by a mother and her two children. Mathias helped the mother perform CPR on her son and comforted her daughter, who passed away moments later. He then administered CPR to the boy until emergency crews arrived and took over. The boy survived. Mathias received a commemorative Goodyear Highway Hero ring during a special event at the Crowne Plaza Louisville Airport Hotel in Louisville, Kentucky. Since it was established in 1983, the Goodyear Highway Hero Award has honored truck drivers who put themselves in harm’s way to help others. The winner was selected by an independent panel consisting of members of the trucking trade media. 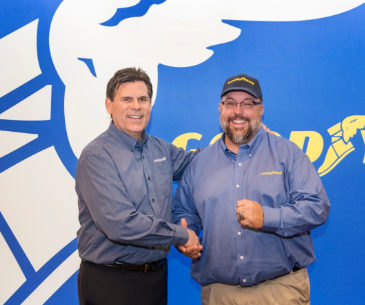 Other finalists for this year’s Goodyear Highway Hero Award included Darrell Atkins, a driver from Alvaredo, Texas, and Don Frederick, a driver from Kimbolton, Ohio.